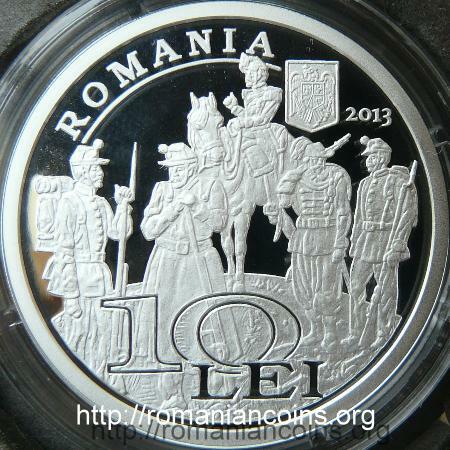 Obverse: ROMANIA, coat of arms of Romania, year 2013, face value 10 LEI, five soldiers from the United Principalities army - four footmen and a horseman (after an image from 1863) Reverse: a fragment of a vintage lithograph representing the Weapon Manufacture at the Army Arsenal, above a coat of arms of the United Principalities, inscription "MANUFACTURA DE ARME ARSENALUL ARMATEI 1863" meaning "WEAPON MANUFACTURE ARMY ARSENAL"
The coat of arms on the coin's reverse was reproduced from the medal struck in 1863 for the laying of the foundation stone of the Weapon Manufacture. As a part of the efforts to create a strong army prince Alexandru Ioan Cuza and his main collaborator in the military domain, general Ioan Emanoil Florescu (1819-1893, minister of war several times), were concerned not only about the unification of the armies of Moldavia and Walachia but also about endowment with weaponry and the respective maintenance. The Army Arsenal was placed on the land of the former princely court on Dealul Spirii. This princely residence was built by Alexander Ypsilantis during his first rule at Bucharest (1774-1782). Finished in 1776, it was destroyed by a fire in 1812, and henceforth known as Burnt Court (Curtea Arsă). Inside the former church of the court the foundry (for cannon round shots) and the forges were placed. Around the building several workshops were built, pyrotechnics mainly. The foundation stone of the Weapon Manufacture was laid on 8/20 of July 1863. The machineries were bought from Belgium, and also several Belgian specialist were hired to work at the Army Arsenal. At the manufacture various spare parts for firearms were made. Also, here the firearms of the army were repaired and also older models of flintlock rifles were modernized for the army. Here handguns and rifles for protocol purposes have also been manufactured (not for regular use). 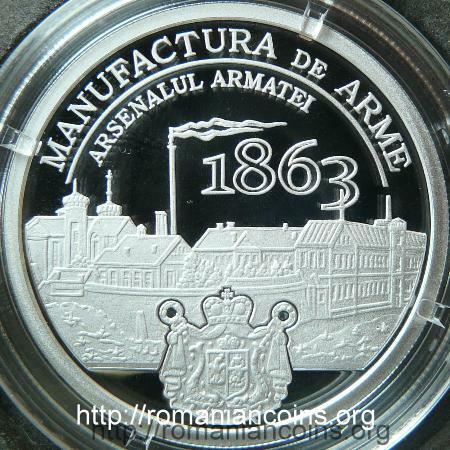 On the Arsenal's Hill (Dealul Arsenalului, where the Weapon Manufacture lay) Casa Poporului - People's House was built, nowadays the Palace of the Parliament of Romania.